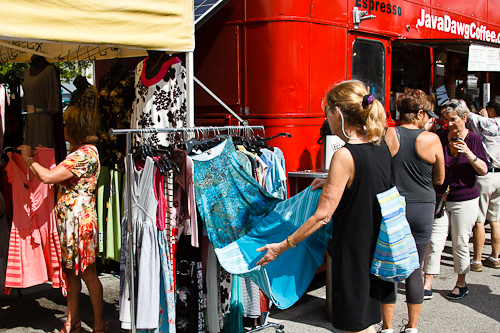 Join Sarasota’s savvy shoppers, foreign film buffs, antiquarians, artists, collectors, vintage & couture fashionistas, diners, spa lizards, and all-round hipsters when they gather EVERY 2ND FRIDAY to stroll on South Pineapple Avenue. Shops and galleries that are usually closed at night remain OPEN from 6 until 8 PM (some as late as 9 PM). 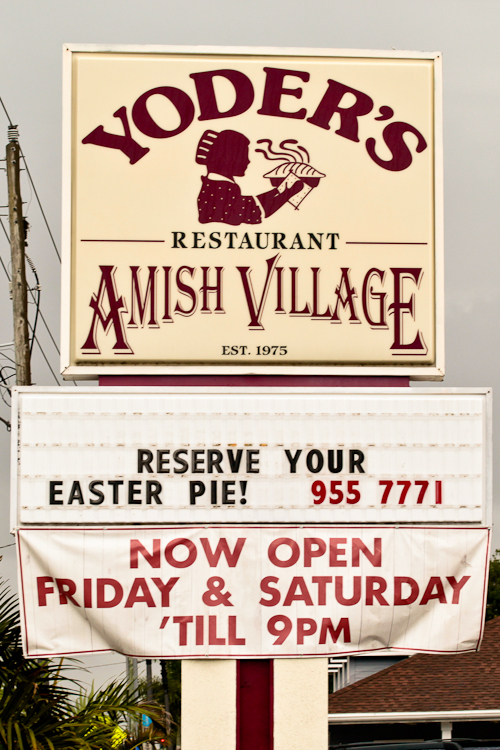 With its Roaring Twenties Ringling-era Spanish-Med architecture, exuberant wall murals, and attractive plantings, South Pineapple and the adjacent live-work-dine enclave of Burns Court comprise one of Sarasota’s most engaging neighborhoods. Since Mother’s Day is only a few days hence, be sure to come out this Friday, May 10, 2013, to stroll, shop, and stay on for a film or al fresco dinner. In fact, this Friday would be the perfect time (before the Sunday Moms’ Day brunch-crunch) to bring Mom out for a relaxed and stylish evening on the town. We’re sure you’ll want to mark your calendar for the second Friday of each month for the rest of the year. There’s always something new to experience in this charming quarter. This week you’ll find casual Italian fashions at newly-opened Jelosa. 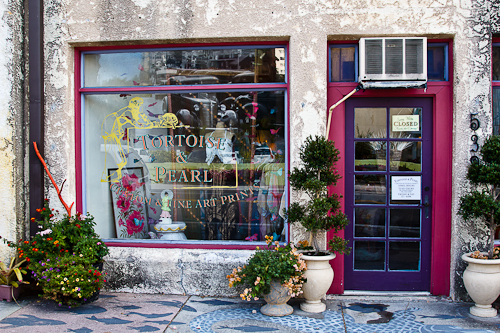 Discover Sarasota’s cutting-edge boutiques, studios, and restaurants when they first pop up, here in pedestrian-friendly Burns Square, where Pineapple meets Orange Avenue. Can’t come Friday night? No problem, since most of the Pineapple shops will also reopen by late Saturday morning. 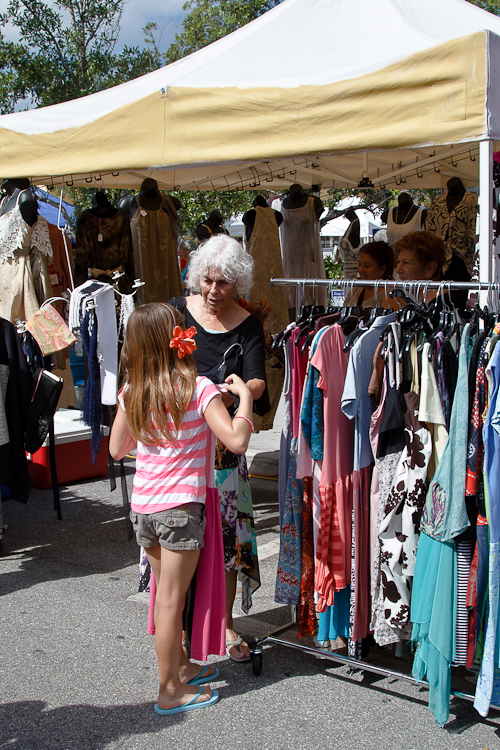 So, count on enjoying the Saturday Sarasota Farmers Market before you meander along Pineapple. 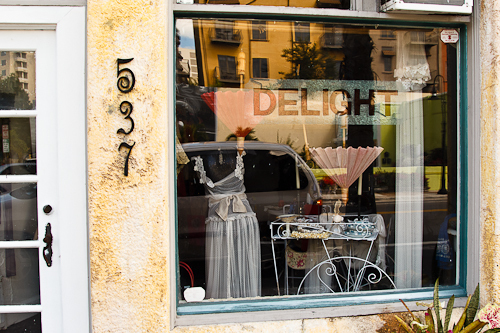 In addition to her shop, you’ll find Delight’s breezy creations under her white tent at the market every Saturday (right next to the big red double-decker Java Dawg coffee bus). Shoppers at Delight Couture at the Saturday Morning Market. More at Delight Couture at the Saturday Morning Market. Note: Even off-season, nearly all shops in the South Pineapple area are open Monday through Saturday, from late morning until late afternoon or evening. However, a few are closed on Monday so it’s a good idea to check before planning your visit. When I learned that Phil Ramone had died, I immediately thought of the photograph above. It’s the back cover of Billy Joel’s recording, The Stranger from around 1977. While Mr. Ramone won several Grammys and at least one Emmy, he had a reputation for being a behind-the-scenes guy, so some of you may not recognize him. He’s the fellow standing, wearing the Yankees shirt. For me, it’s a perfect photograph for several reasons: It’s a bunch of guys—obviously friends—getting together for a meal at a neighborhood restaurant. 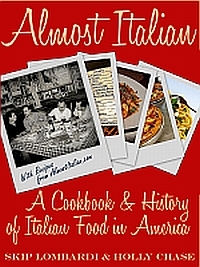 We can pretty well surmise from the surroundings that the cuisine is Italian. It helps that the guys are drinking wine from juice glasses. It tells me that outside the recording booth, this is a place and these are some people with whom Mr. Ramone is very comfortable. You can read or hear obituaries for Phil Ramone practically anywhere today. But for me, as this photo illustrates, he was a New York guy who elicited a New York sound from every recording he produced. And he accomplished this without being a prima donna or a tyrant. He did it by being a friend. Standing in phograph (L – R): Phil Ramone (Producer) Liberty DeVitto (Drums). 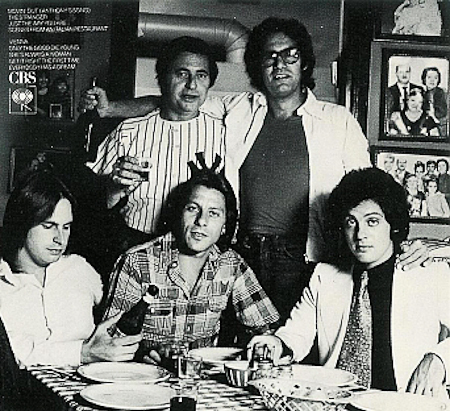 Seated (L – R): Doug Stegmeyer (Electric Bass), Richie Cannata (Alto & Tenor Saxophones), Billy Joel (Piano, Vocals). 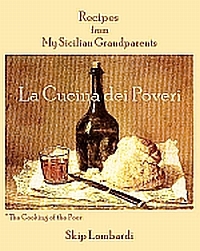 Location is unattributed (but I’ll bet Scungilli and Sausage & Peppers are on the menu. While tourists may bemoan their luck whenever they encounter ever-greater aberrations in Florida weather, our neighbors and their landscapers surely rejoiced in the thunderstorms of the past week. 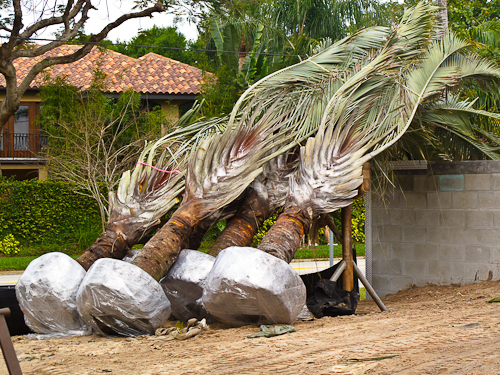 It’s not every day we can watch a cargo of Dypsis decaryi, Triangle Palms, off-loaded at a private residence. And it’s a blessing when mature palms can be installed without someone leaving a hose running for several hours. Along with the flowering Madagascar periwinkle, baobabs and the traveler’s, Bismark, and raffia palms, Dypsis decaryi are among the distinctive flora of Madagascar, where their habitats are seriously endangered by the island nation’s rampant deforestation. Thus, the Florida propagation of these striking exotics may help keep triangle palms from extinction. 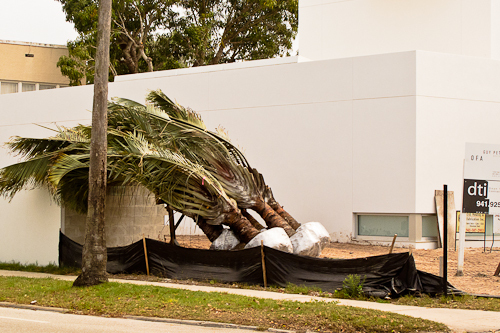 We’re delighted to welcome these stately, silvery palms to the neighborhood and wish them their share of April showers!